We at Masterpiece Models are proud to present our newest product launch, the Scale Ruler. Our Scale Rulers come in 1/72nd, 1/48th, 1/35th and 1/32nd . All rulers are in the exact scale represented in the ruler including scale metric in meters. 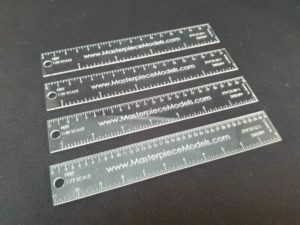 Whether you’re a seasoned pro or just starting out, you’ll find that the Scale Rulers from Masterpiece Models is a must-have tool for all of your projects. Click here to purchase them in a four pack. Click here for the 1/32 Scale. Click here for the 1/35 Scale. Click here for the 1/48 Scale. Click here for the 1/72 Scale.